I’m sure many of you will probably still have questions after reading the trilogy about teeth bleaching (Part 1, 2, and 3), so lets go through some of them here. Please ask in the comments section if you have more questions, and I will answer them! ‍Bleaching gel does contain hydrogen peroxide, which is a corrosive product. The only worry is the hydrogen peroxide from the gel coming into contact with gums, which will cause irritation. As such, dentists use something called a rubber dam to protect the gums. This will ensure that the gel comes into contact with only the teeth. ‍2. I’ve heard people complain about sensitive teeth after bleaching. How bad is it? ‍The science behind the mechanism by which bleaching causes sensitivity is still not well understood. A suggestion is that once the agent enters the tooth, an oxidation reaction occurs. As a result, this leads to temporary sensitivity. Studies have shown that this sensitivity should subside on its own after a few days. If you have naturally sensitive teeth, do expect a greater than usual increase in the intensity of the sensitivity of your teeth. Highlight this to your dentist if necessary. ‍3. Will my teeth remain white after bleaching? ‍If you continue smoking or continue drinking a lot of tea and coffee, your teeth will eventually look discolored as stains start to accumulate. Do maintain good oral hygiene. However, nothing is permanent, and even with good brushing habits, expect the whiteness to fade over time. 4. 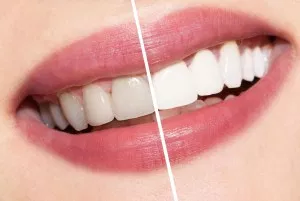 What should I do when my teeth goes back a few shades darker?Not to worry, this is normal depending on the food you eat, brushing habits, if you smoke, genetics, etc. You can either re-whiten your teeth or visit the dentist to get some support!